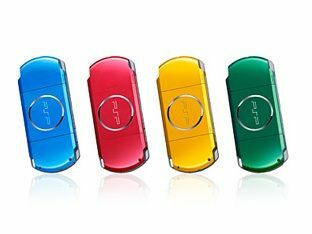 Nothing says 'funky games console' like a host of colour options, which is probably why Sony's PSP has just been released in four bright hues in Japan. The Japanese electronics giant has not had a good time of things of late, and it was its gaming division that took a lot of the heat for poor financial returns. But if anything can turn things around, surely it's the arrival of the PSP in "Vibrant Blue," "Radiant Red," "Bright Yellow" and "Spirited Green". The so-called 'carnival colours' range is Japan-only for now and available in limited numbers, although should the home nation go wild for the new colours, then it's a fair bet they'll make a move west. Currently the PSP is available with three outer coats – Piano Black, Pearl White and, more rarely, Mystic Silver. But wait, there's more: Sony's also serving up a celebratory range of official peripherals for the handheld including a colourful 4GB Memory Stick PRO Duo, an original PSP pouch, battery packs and, for completionists, even a wrist strap and cloth. We'll keep you informed should there be any mention of UK availability.